Light & Darkness Radio: Featured Today! "Ensiferum, Wolfchant..."
You guys blasting with L&DR on your Android/Iphone? As usual and in every each of this posts I want to Thank you all because after all you guys make L&DR possible, So Here's Today Featured Bands! Ensiferum (FI) - Ensiferum was founded in 1995 by Markus Toivonen (guitar), Sauli Savolainen (bass) and Kimmo Miettinen (drums). For the band's name, they took the Latin neuter genderadjective ensiferum, which means "sword bearer". In the next year, Jari Mäenpää was taken into the band as singer and second guitar-player. In 1997, the first demo was released, containing three songs. In 1998, Sauli and Kimmo left the band and were replaced by Jukka-Pekka Miettinen (Kimmo's little brother, then 14 years old) and Oliver Fokin. In January 1999, a second demo was recorded, which although it did not produce a recording deal, boosted the band's confidence. In November 1999 a third demo, "Hero in a Dream", was recorded, which was successful in obtaining a record deal with Spinefarm Records. The logo that appears on all the bands releases was designed for the third demo by Tuomas Tahvanainen, who also designed the logos for the earlier demos. 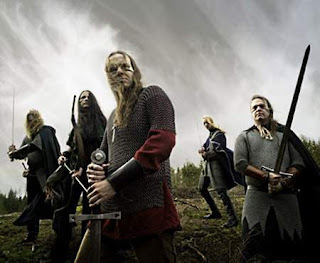 In 2000, the band went into the studio to work on their first album, Ensiferum, which was released in August 2001. In the same year, Meiju Enho joined them as a keyboard-player. In 2003, after the work was completed on the second album, Iron, Jari had left the band due to conflicts between scheduled studio work on his side project Wintersun and touring with Ensiferum. For the tour with Finntroll, Petri Lindroos from Norther replaced Jari on guitar and as singer, and became a member of the band after the tour. In December 2004, Jukka-Pekka left the band and was replaced by Sami Hinkka (Rapture). Oliver also left in 2005 to be replaced by Janne Parviainen. The new Ensiferum line-up entered the studio later that year to record an EP to be called Dragonheads, which was released in February 2006. As well as the title track, it also contained two reworked demo songs; an Amorphis cover and a short rendition of the Kalevala melody, as well as a medley of three traditional Finnish songs. In June 2006, Ensiferum released their live DVD, 10th Anniversary Live, which was recorded in Nosturi, Helsinki, on December 31, 2005. The recording of the third studio album, called Victory Songs, took place between November 2006 and early 2007, and was released on April 20, 2007. A single titled "One More Magic Potion" (after the track of the same name) was released on February 7. Following the album release, the band released through the producer's MySpace page, a music video for the song "Ahti," which included all band members featured as extras. The video was released after the album release due to video filming problems. On September 10, 2007, it was announced that keyboardist Meiju Enho would leave the band. This was posted in a bulletin on their MySpace page and later confirmed on their website. The band used Emmi Silvennoinen of Exsecratusas a touring fill-in. She later became a permanent member of the band during the recording of the From Afar album. Ensiferum headlined the Paganfest tour in Europe and North America in 2008. Others playing the tour included Týr and Eluveitie, with Moonsorrow and Korpiklaani also joining them on the European part of the tour, and Turisas in North America. They also supported Megadeth on the opening night of their United Abominations – Tour of Duty European tour. Ensiferum also supported Amon Amarth on their North American Twilight of the Thunder God tour. Shortly before their Russian tour in 2008, vocalist/guitarist Petri Lindroos fell "seriously ill" and was unable to participate. The band hired ex-bassist Juha-Pekka Miettinen to assume Lindroos' guitar duties, while bassist Sami Hinkka took over his lead vocal duties for the tour. In the first half of 2009, Ensiferum performed at a string of festivals including Frostrock in Belgium, Finnish Metal Expo and Tuska Open Air in Finland, Winterfire, Rocktower, Legacy and Rock am Härtsfeldsee in Germany, Summer Nights in Austria, and Z7 Metal Dayz in Switzerland. In June and July they toured North America as part of the Summer Slaughter Tour with Necrophagist, Darkest Hour, Suffocation, Blackguard, Dying Fetus, Beneath the Massacre, Origin, andWinds of Plague. In August they will perform at the Global East festival in Ukraine, Ankkarock and Jurassic Rock in Finland, and Let's Open Air in Turkey. Ensiferum released their fourth studio album, From Afar, on September 9, 2009 on Spinefarm Records. The album was produced by Nightwish producer Tero Kinnunen and Victory Songs producer Janne Joutsenniemi, and it was mixed by producer Hiili Hiilesmaa. The limited edition of the album includes a cover of Swedish folk rock group Nordman. Following the release, the group will embark on a European tour with Estonian folk metal band Metsatöll and Finnishmelodic death metal band Tracedawn. In October they will also perform at Hellflame Festival – The South Side of Hell and Devil's Revenge festival in Germany, and Tattoo the Mind in France. Ensiferum performed on the second day of the inaugural Screamfest Festival in Sydney, Australia, on New Years Day 2010. In November/December they toured North America with Ex Deo (on selected dates), and Blackguard. Ensiferum have also been confirmed to play Bloodstock Open Air at Catton Hall, United Kingdom in 2010. In October 2010, Ensiferum embarked on their first ever South African tour. This tour consisted of four shows in two cities, and they were accompanied by numerous local metal bands including Riddare av Koden and All Forlorn. The final show, at The Black Dahlia in Johannesburg was filmed to potentially appear on their next live DVD. In early 2011 Ensiferum will embark on The Ugly World Tour 2011 with labelmates Children of Bodom, Amon Amarth, Machinae Supremacy supporting them for segments of their tour in the U.S and Canada. The tour will take place within a 4 month period of time and span 23 countries. Wolfchant (DE) - In 2003, the formation WOLFCHANT was founded in St. Oswald/ Lower Bavaria (Ger.) by the members Lokhi (voc. ), Gaahnt (bass), Skaahl (lead guit.) and Norgahd (drums). The band emanated from diverse extreme metal bands, which were left by the members, to advance their individual musical development. On the first demo “The Fangs Of The Southern Death”, which was published in 2004, music style was a mixture of gruffy melodic death and dark metal. But in the same year, the band produced another demo called “The Herjan Trilogy” which was the cornerstone for the new style of WOLFCHANT. Henceforth, songwriting has been pushed on a high melodic and hymnic level with a broad spectrum of mood and temper. Due to the very positive feedback on the existing material, WOLFCHANT restarted working on new songs more enthusiastic than ever to finalize times of just making demos. In 2005 the line up was completed with Derrmorh (rh.guit). Heavily laden with new songs they participated different samplers, which attracted attention of diverse record labels who were aiming for partnership. Finally, the deal was arranged with the label CCP Records. Together they are working on the growing success of WOLFCHANT. Thus, CCP Records published WOLFCHANT’s self-produced debut “Bloody Tales Of Disgraced Lands” in November 2005. Most of the album’s reviews were very positive and a large listenership was adressed. That was followed by numerous gigs and different achievements, e.g. a placement in the “Legacy” magazine’s reader charts! Now, the debut is followed by another, even harder and more aggressive blasting long player called “A Pagan Storm”. But they still keep their true and incomparable style without repeating themselves- i.a. a result of leaving out keyboards- which are commonly used in this genre- and setting new priorities in celebrating their music. Although “A Pagan Storm” has a more aggressive style it doesn’t lack graceful acoustic passages and also traditional instruments like flute, mouth harp and accordion are used to put emphasis on different parts. Most texts on the albums talk about nature, but it was also very important for the band to pick up legends about the nordic mythology which is a very central topic on every song idea. In march 2007 Gaahnt left the band and Nattulv took over his position. In may 2008 Nattulv left the band for time reasons and Bahznar entered the band and took over the bass. On February 25th 2011 They released their newest album "Call of the Black Winds" With their substantial arranged concept WOLFCHANT surely will convince the pagan, viking and heathen listenership and truely, follow their path consequently.